Description: Rethinking Regulation of International Finance encapsulates the most important aspects of the development and operation of the international financial system. This book questions the fundamental basis of the existing international financial architecture (soft law) and explores the need for a compliance-based model based on legitimacy of regulations and accountability of the regulatory bodies in international financial stability. Why have financial standards and institutions almost always failed to effectively predict and respond to real-world financial crises? The answer, as this challenging book shows, is that international financial law suffers from a persistent lack of judicial or quasi-judicial enforcement mechanisms, leaving flaws in the structure of the international financial system that lead inevitably to excesses that threaten the public good of global financial stability. 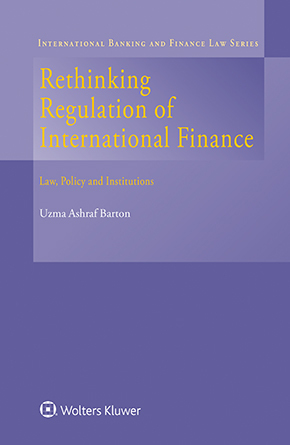 The author, an internationally renowned legal expert on financial and fiscal reforms, responds to the increasingly urgent call for rethinking the structure and the functioning of international financial law and argues that a resilient procedural mechanism with judicious regulatory substance can make the financial system safer for all actors, including the taxpayers of not only the Member States but also the unrepresented countries. To this end, the book suggests short-to-medium term reforms within the existing financial system and for longer-term it recommends an unconventional alternative that takes risk away from the market and thereby makes every stakeholder accountable to the system. consolidation of crisis-prevention and crisis-management policies. The analysis takes into account instances from trade and monetary systems pertinent to the development of the discipline of international financial law. The concluding chapter explores possibilities for putting in place an asset-backed resilient financial system based on risk sharing that is empowered to legislate reform and authorized to seek compliance from its members. Thank you for this article. I would like to read this book.